During the year of 1871, Apache raids against settlers hit epidemic proportions. Due to the enormous onslaught of raids the War Department elected to establish a new Military Department of Arizona, which established its headquarters near Prescott. At the time, the Indian Bureau in Arizona consisted of a series of supply depots and temporary reservations whose existence had become essential for those Apaches who wanted to subscribe to the peace process. It was at these locations that they obtained food rations and supplies. Unfortunately, many of the younger Apaches were not interested in the peace process, and they had no intention of giving up their way of life. On April 27, 1871, Lieutenant Howard Cushing led a contingent of 9 men into the Whetstone Mountains in search of Cochise and other Chiricahua warriors. They traveled for a week without any sign before they were ambushed by an estimated 280 Apaches. The Apaches swarmed like bees, in what became a ferocious firefight. Before it was over 8 of Cushing's men were dead. Then just three days after the massacre things really got out of hand. A vigilante group composed of 148 men, who were largely from Tuscon, attacked the Apache settlement at Camp Grant. The camp was under the direct supervision of the Indian Bureau. 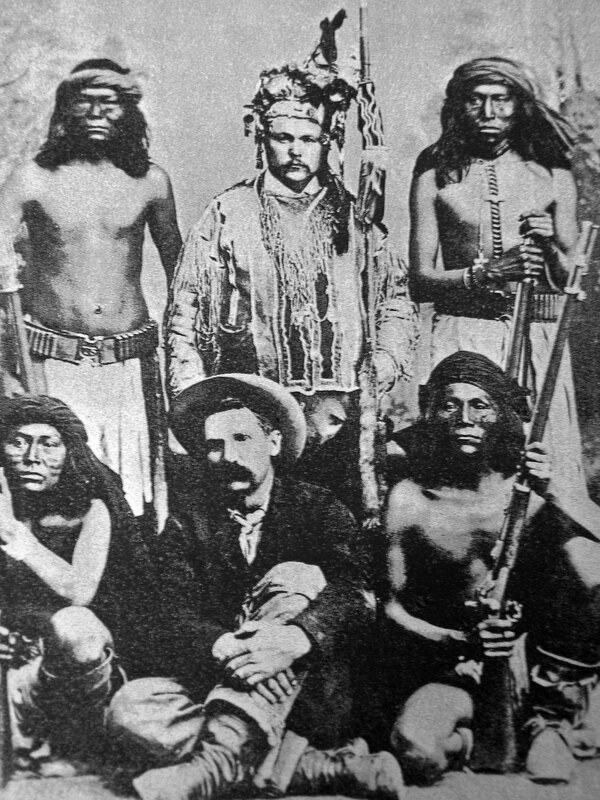 The vigilantes killed an estimated 150 Apaches, who were mostly women and children. The attack sent President Grant's peace process into total chaos. The newspapers across the nation denounced the massacre, and at the same time the Apache lost all trust in the government. By September 1872, more than 42 settlers had been killed in numerous raids. In November, General Crook led an all out offensive against the Chiricahua Apache. He implemented the same search and destroy methodology that had worked so effectively for Kit Carson in his skirmishes against the Navajo and Mescalero Apaches. He primarily focused on destroying items that could not be easily replenished during the winter months. The first major skirmish occurred on November 25, at Hell Canyon. Here the Apache lost eleven men, and the U.S. Army did not suffer a casualty. Next, Crooks men would corner 77 Yavapai Indians in a cave, mistaking them for Apache. When, the Yavapai refused to leave the cave the soldiers fired their rifles until 57 had died. The survivors were mostly women and children. A short time later, Crook's men launched a surprise attack in what became known as the Battle of Turret Mountain. At this time, 23 Apache were killed. Numerous soldiers were reward for their valor. In all, 25 of Crooks men were awarded the Congressional Medal of Honor for heroism. This battle essentially ended the offensive, and shortly afterward many of the Apache began surrendering themselves at reservations. Several more skirmishes would occur throughout the summer of 1872. General Crooks offensive is considered by historians to be one of the most successful campaigns of the Indian Wars. Shortly, afterward Crook was elevated to the rank of brigadier general. He would continue to use his scorched earth policies for the next two years, as Apaches continued to raid.